1. Investors cheer FBI finding: FBI director James Comey said Sunday that his agency is sticking to its view that presidential candidate Hillary Clinton should not face criminal charges over her personal email server. Global markets moved higher on the news. Analysts have predicted that stocks would suffer if Donald Trump was elected president, and this announcement could give Clinton a boost. 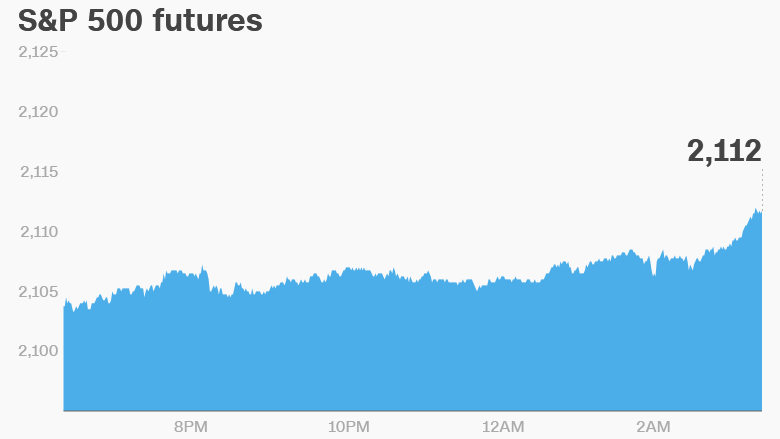 U.S. stock futures are surging by more than 1%, alongside European markets. Asian markets are also closing out the day with gains, though the moves higher weren't as dramatic. Investors are selling out of government bonds, with U.S. and Australian bonds feeling the biggest impact. And the Mexican peso is surging. Comey said more than a week ago that the FBI was looking into new emails as part of its investigation into Clinton's personal server. This contributed to a nine-day losing streak for the S&P 500 -- its longest since 1980. 2. China's finance minister gets booted: China has removed a top official who played an important role in trying to reform the country's debt-laden economy for the past three years. In a statement, the government said Finance Minister Lou Jiwei will be replaced by Xiao Jie, a former tax chief. No reason was given for the change, and the statement didn't say what Lou might do next. Lou, 65, held the job during a turbulent period for China's economy, which is growing at its slowest pace in 25 years. He is credited with helping efforts to tackle the mountain of debt accumulated by local governments in China. 3. More trouble for Volkswagen: German prosecutors have expanded an investigation into the Volkswagen (VLKAY) emissions cheating scandal to include the automaker's chairman, Hans Dieter Potsch. Potsch was the company's chief financial officer when the scandal erupted late last year. He became chairman soon afterward. Shares in Volkswagen are rising a bit Monday, but the gains are not enough to keep up with the rest of the market. 4. Market movers -- Crude oil, HSBC, Ryanair: Crude oil futures are rising by about 2% to trade around $45 per barrel. Traders expect the world's biggest oil producers -- including Russia -- will keep a lid on their production to ensure the market isn't flooded with excess crude. Shares in HSBC (HSBC) and Ryanair (RYAAY) are soaring in London trading after both companies reported well received quarterly results. 5. Earnings: Ferrari (RACE) and Sotheby's (BID) are the key companies reporting quarterly results before the open. Marriott (MAR), News Corp (NWS) and Priceline (PCLN) are reporting after trading closes.